We can’t know what’s going to happen. We can just try to figure it out as we go along. 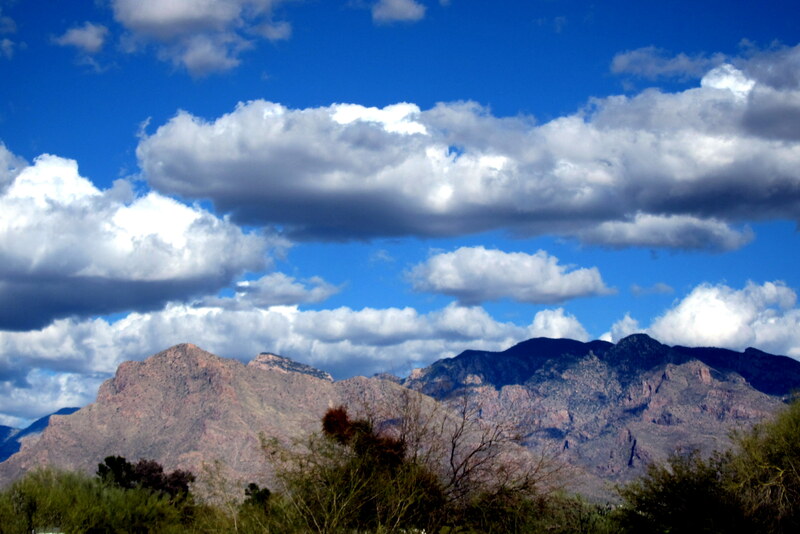 Sunday, March 1, 2015-Organ pipe Cactus National Monument: Up to overcast skies, cool temperatures and gentle breezes from the southwest. As Kit and I were breaking camp and saying goodbye to our home state neighbors Tom and Sharon, another New England winter escapee wandered by with his friend from Montana. On the left is Adam, who lives with his wife in Boston and has a summer place on Bailey Island in Maine. They are IT folks who work from anywhere there is a reliable internet connection which allows them to travel south during the winter. By 1145 Kit and I are hooked up and back on the road. Retracing our steps to Why, Arizona we veer to the east on AZ-86. Why Why? Well, why not? 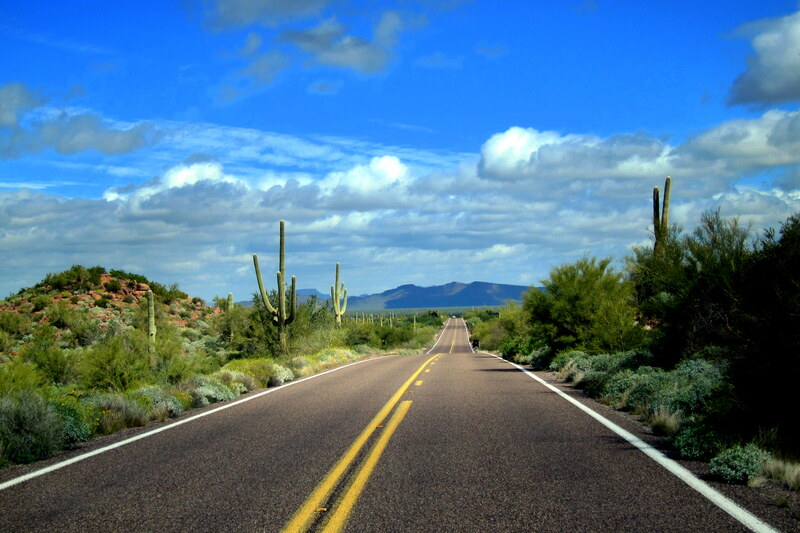 There are no other US roads out of Organ Pipe than the one through Why! Oh, and there isn’t a “Y” in Why…..just a “T”, which dumps onto the state highway that leads toward Tucson, which starts with a “T” but has no relation to the “T” in Why. 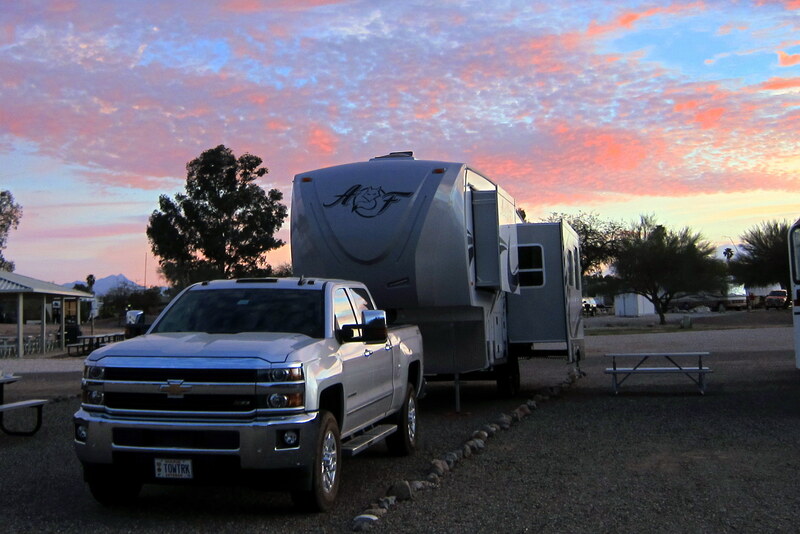 Following a few hours of enjoyable backroad travel, Kit and I pulled into Agave Gulch Campground at Davis Monthan Air Force Base. This military RV Park has an efficient and very fair method of campsite selection. No homesteading allowed….after 21 days, you have to roll off to overflow and let someone else have a turn. And, overflow is much nicer than any other military park in the system…..true, there are no hookups but the sites are large, level and well maintained. Usually one only has to stay a day or two in overflow before moving to full hookup, but since we are only planning on being here for a few nights, I didn’t bother putting our name on the wait list. Since we are coming from dry camping at Organ Pipe, I first swing by the dump station to take care of the necessaries. As I’m dumping the black and gray water tanks and filling the white water one, Kit takes our pile of laundry to the river and begins beating the clothes on a rock. Confident I can move the rig a few hundred feet without my traveling companion; I make my way to the overflow area and select a nice site as the sun begins to set in the west. As you may have noticed in the photo above I generally favor the left side of any site to maximize space in the front (also known as the street-side) of the camper. This method worked very well with our former trailer, however when a 46 inch slide is involved the extra width can be a problem. Fortunately, there were no immovable objects in the way of the slide, but unfortunately I encroached on our neighbor’s space by about a foot. Fortunately he was very understanding about my RV faux pas and laughed it off……gotta pay better attention to the positioning of this new rig! 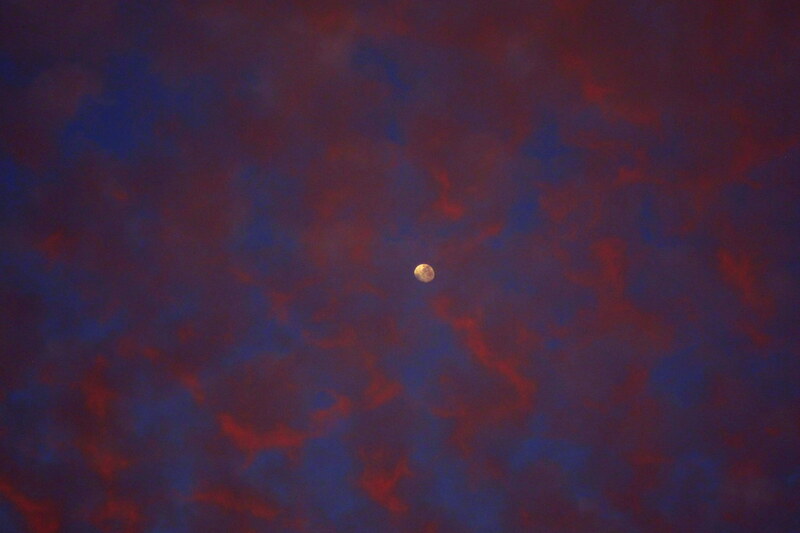 As we settled in for the night, I noticed a Gibbous Moon nestled in the Cumulus Clouds being illuminated by the retiring Solarorbeus. Yea, I had to look those fancy words up…..however the sight did make for an interesting photo! 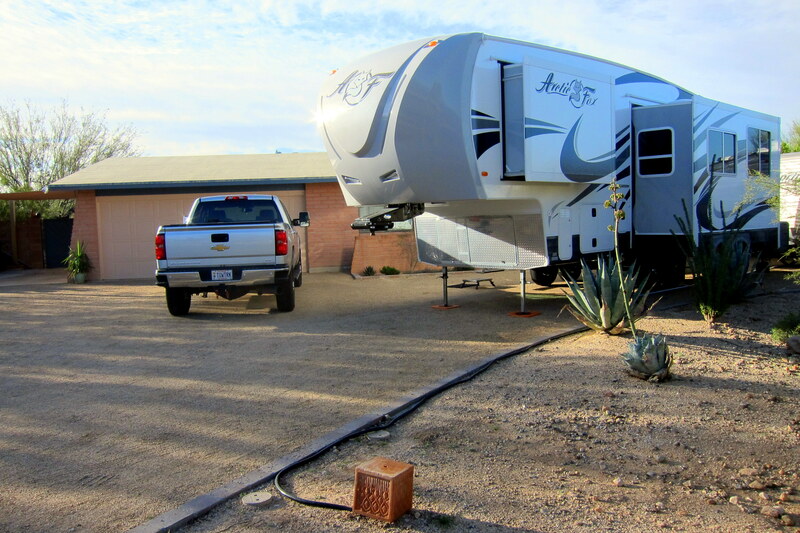 Monday, March 2, 2015-Agave Gulch Campground, DMAFB, Tucson, Arizona: Generally while in the town, we dooryard surf with my brother and sister-in-law….however they are still on the left coast enjoying time with family. They kindly offered to let us pull into their place anyway, but we decided to stay on base to get resupplied and take care of some truck/trailer maintenance. While bouncing about the US, Kit and I notice a huge variety of RV’s. This park had a few examples of the extremes. There was an antique motorhome. A custom built unit on a Volvo truck chassis. And a Blue Bird (Yea, the bus company) motorhome that retailed north of seven figures. Some folks have way too much disposable funds! 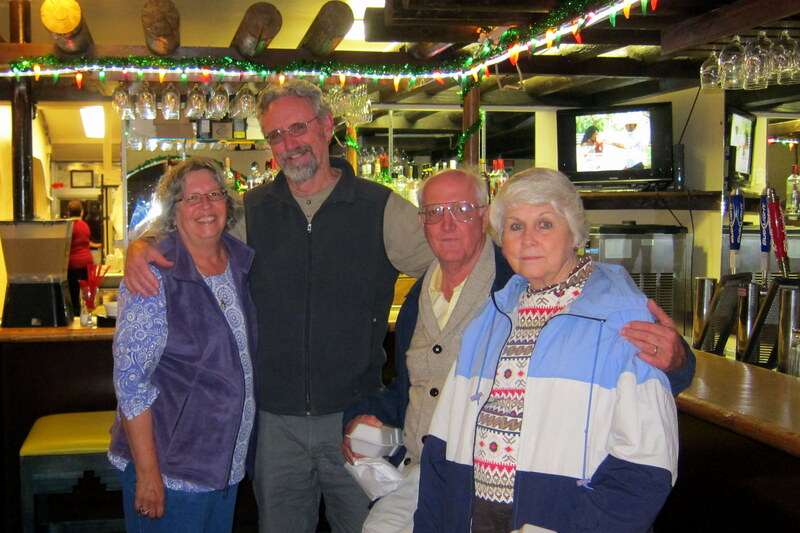 After a run to the base commissary and exchange followed by a pilgrimage to Camping World, Kit and I met some folks for dinner at El Molinito’s in South Tucson. David and Bonnie are related to Dean, my mother’s final and favorite, husband. David would stop and check on my mom whenever we was in the area…..she always enjoyed his visits and we always appreciated that he took the time to see her. Everyone appeared to enjoy the excellent food and engaging conversation. 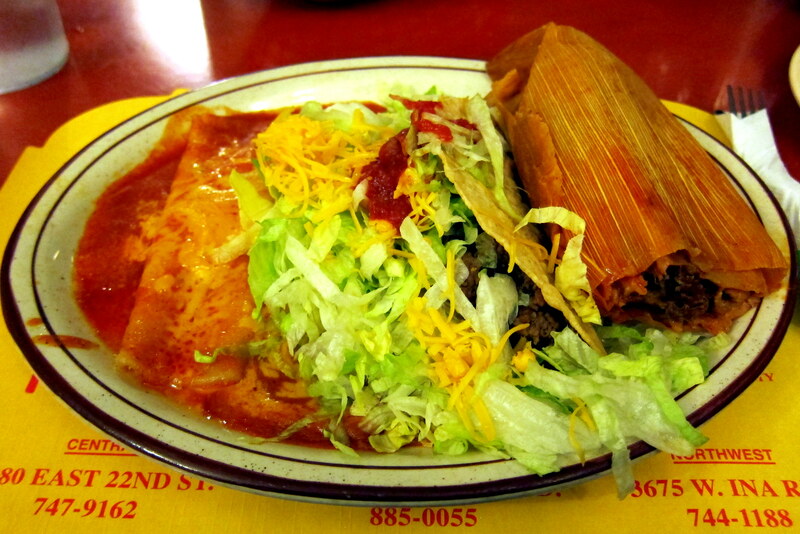 Can’t go wrong with Mexican cuisine in southern Arizona! Back to the campground long after dark, Kit and I turned in for the evening excitedly looking forward to the next week. 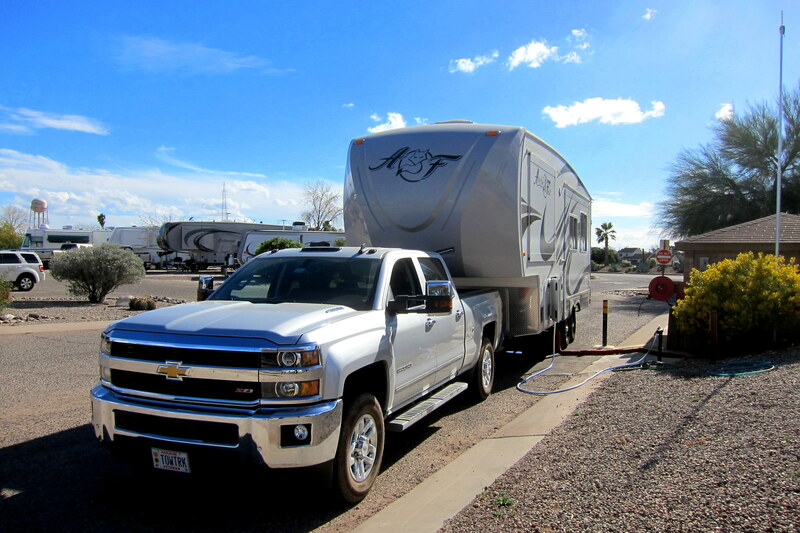 Tuesday, march 3, 2015: Heard from Dew and Bea that they are back in town, so we decided to relocate a few miles to the north and enjoy our favorite dooryard camping opportunity at the Doobie RV Resort! 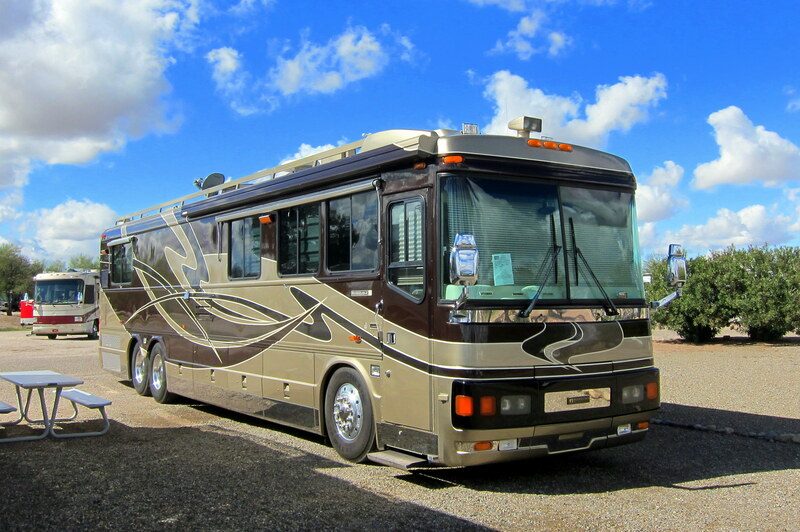 Their large and accommodating driveway is perfect for visiting RV’rs. 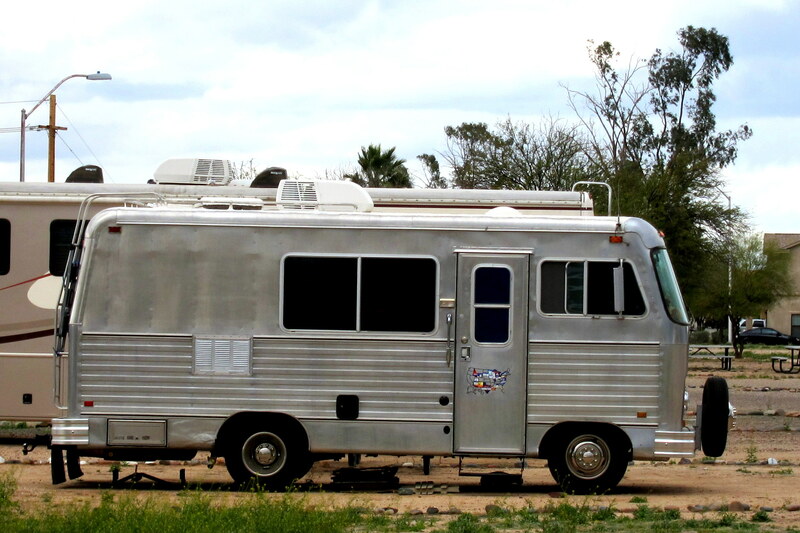 And since Dewey and Bea have a travel trailer of their own, they know what is needed to provide a comfortable stay. In addition to a freshwater connection, and a 30 amp electrical outlet, they conveniently have a sewer line connection alongside their driveway……that’s the upside down square terracotta pot you see with my auxiliary grey water hose feeding it! Kit and I spent the remainder of the day, relaxing, enjoying Dewey and Bea’s company, eating some great food and quaffing a few Margaritas…..Ah, life is good! 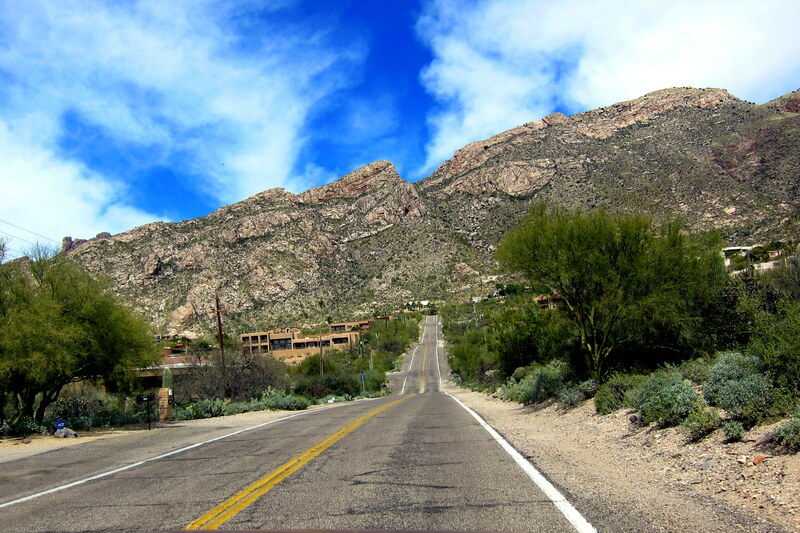 Wednesday, March 4 through Wednesday, March 11, 2015-Tucson, Arizona: For the most part, the weather during our stay was incredible….sunny and warm during the day and cooling off in the evening! During this visit to Tucson, we had a number of family issues to contend with; however we did eke out a few days for play time! One day, we all went to the locally famous…..Gallery in the Sun. 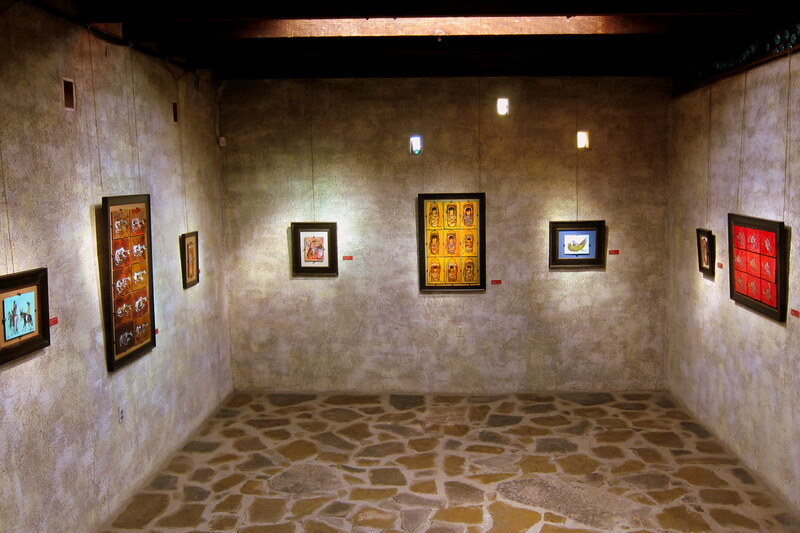 The place is a unique art gallery of southwestern works by the painter Ettore “Ted” DeGrazia. Kit had learned of him from our neighbors at Organ Pipe Cactus National Monument and from our sister-in-law Bea, so really wanted to check it out. Now normally I’m not much of an Art Gallery person, however I will have to admit the story behind this artist and his incredible body of work did intrigue me! As one enters the gallery, the first thing they will notice is how low the door is and how the first few feet resemble a tunnel. This was intentionally designed by DeGrazia to represent his father’s life as an immigrant copper miner in the nearby mountains. 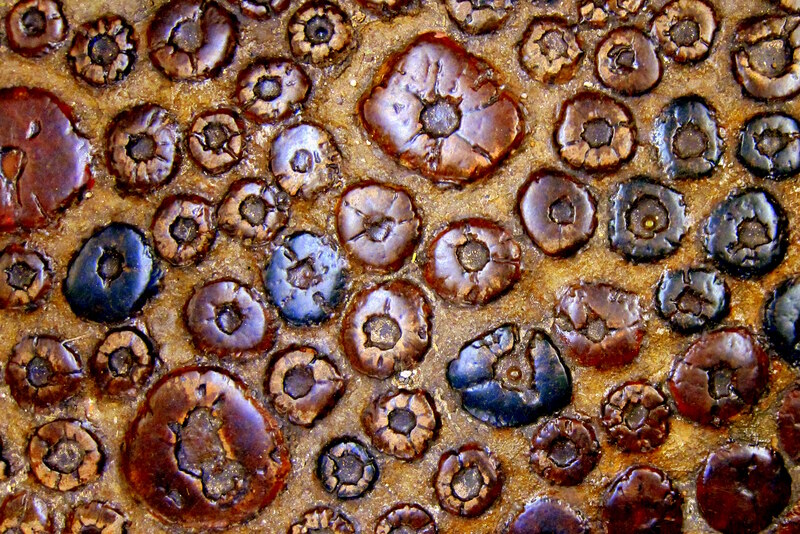 The gallery is constructed using local materials in the native tradition, including this unusual floor made up of Cholla Cactus sections laid on end. The material makes for a very durable and interesting effect! A number of other floors throughout the gallery are laid up with Mexican Tile which made a perfect backdrop for the “Four Amigo Dorky Keen Club” photo. 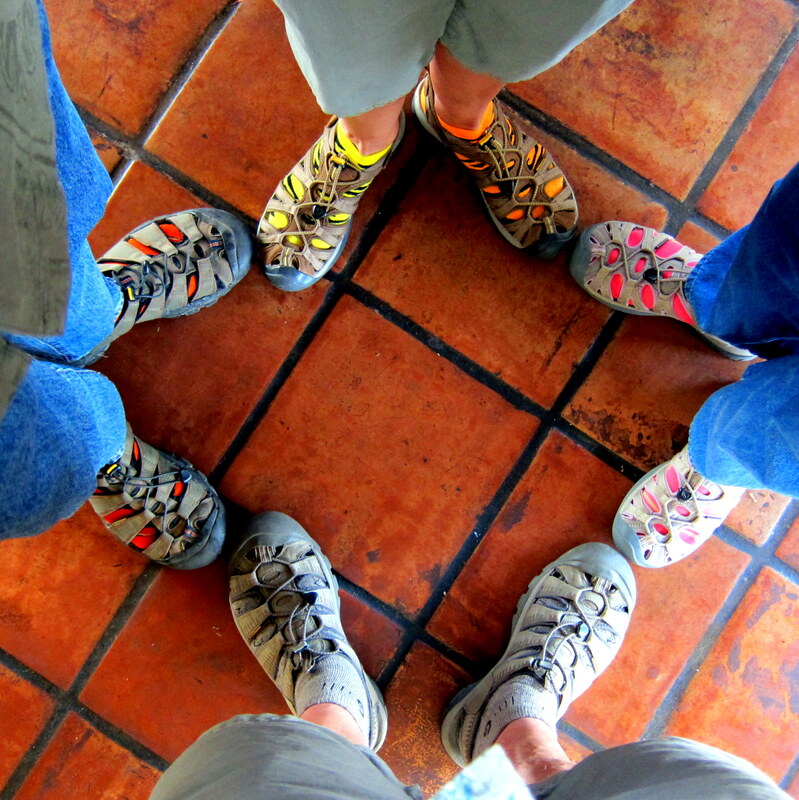 Keen sandals are the preferred footwear for retirees here in the Southwest…..they are rugged, cool, and comfortable. On a few occasions we have taken multi-mile hikes in these clunky things and they perform very well. 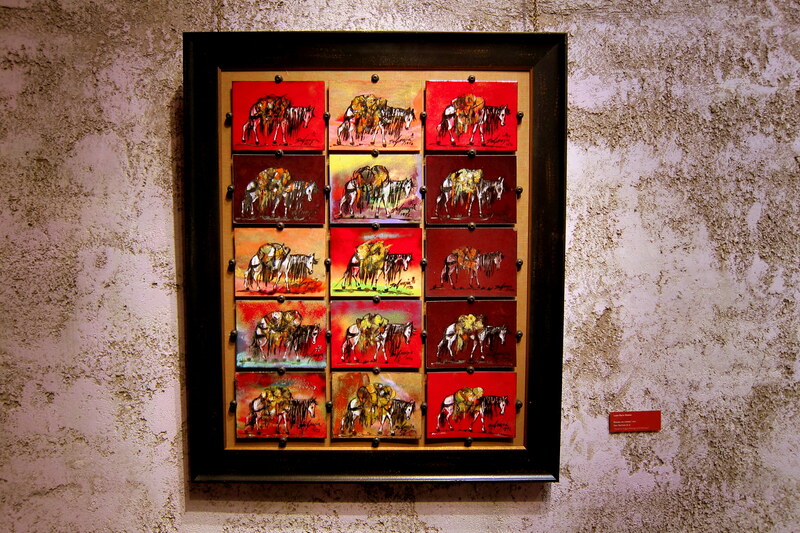 Ted DeGrazia is of Italian heritage and was born in Arizona three years before it became a state. 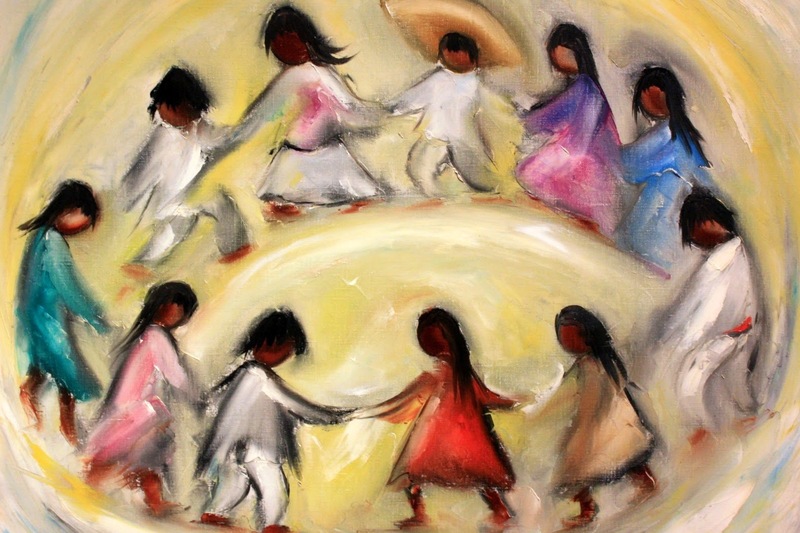 He is known as a colorful character that creates colorful paintings of Native American and Mexican children in addition to many other subjects that define the American Southwest. The Gallery contains a number of interconnected rooms, all built in the same style. One entire room features his collection of religious art. 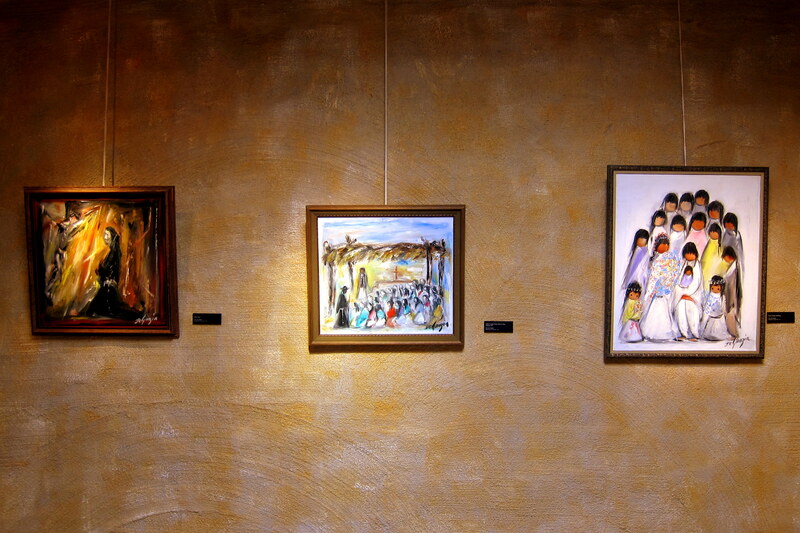 A devout Catholic, DeGrazia painted his interpretation of the Stations of the Cross which are pictured below. A master with the palette, DeGrazia painted with a vivid imagination…..many of his works features his own personal interpretation of the subject. As he became popular with America’s elite, DeGrazia was able to command more money for his work. His big break came as a result of UNICEF selecting one of his paintings for its annual Christmas card. The card sold millions worldwide and introduced him to the general public…..this created an even stronger demand for his art. As he became prosperous, DeGrazia enlarged his studio and gallery to accommodate more visitors. He soon became concerned that his collection, which had little intrinsic value to him, was being appraised by the government at a very high price. As way of protest, DeGrazia hauled many of his paintings by horseback to the nearby Superstition Mountains and set them ablaze…..much to the horror of art historians worldwide! Upon returning to his studio, DeGrazia established a nonprofit foundation to ensure his art will be protected from government taxation and available for future generations to enjoy. 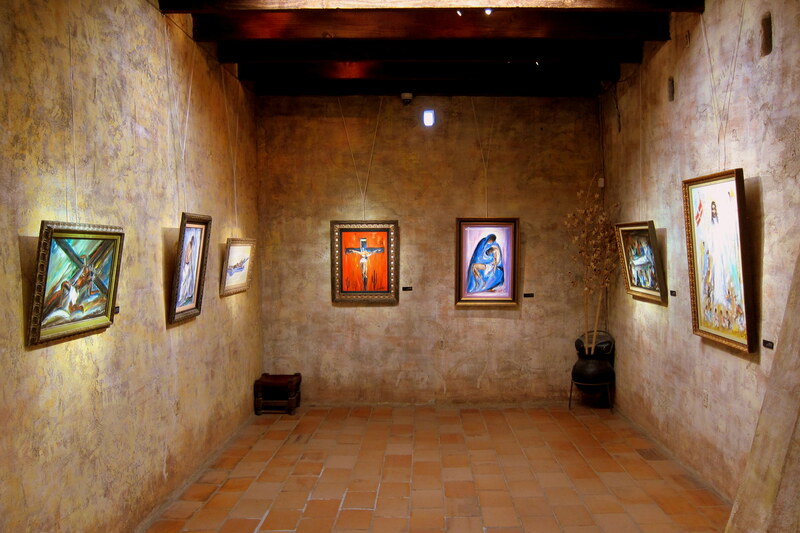 What an incredible collection of original southwestern art…..Kit and I highly recommend a visit to the Gallery in the Sun if you are ever in the area! As mentioned previously, there were a number of family items to attend to while in Tucson. When she passed, my mother left a home full of mementos and household items. Kit, Dew, Bea, Dan and I spent a number of days going through mom’s stuff. Some we donated to charity, some we donated to the town dump and the rest of the items we split up amongst ourselves. I shipped four good sized boxes home to add to all the other “stuff” we have in our cellar. Also, while in town, I was able to get the oil changed in the truck. 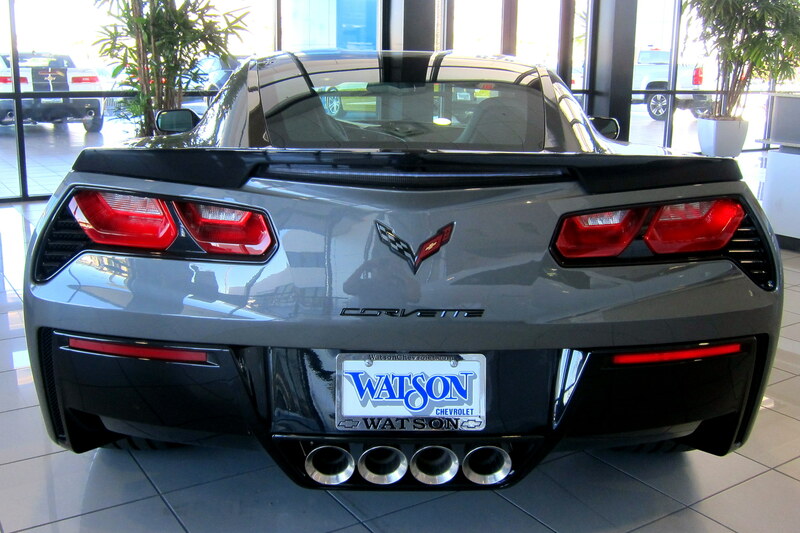 Watson Chevrolet has been my go to dealership for truck maintenance while on the road and I have consistently received great no-nonsense service. 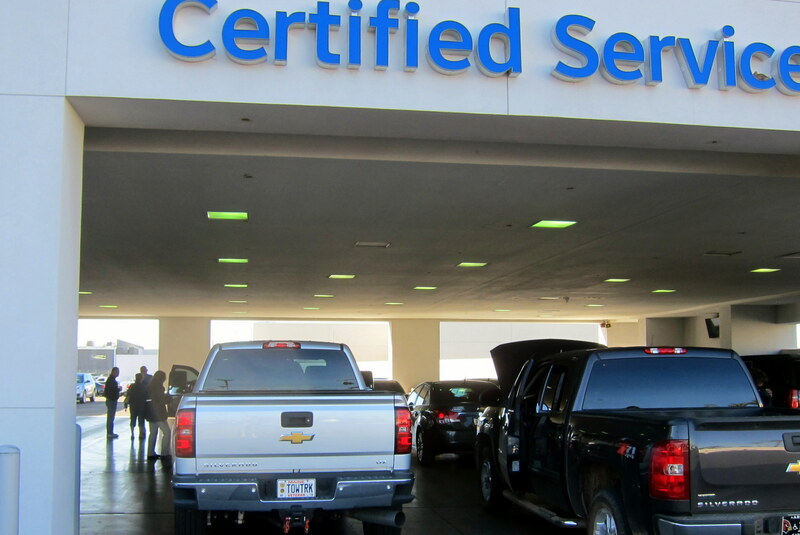 A new benefit provided by General Motors is their covering the first two years of schedule maintenance free of charge. At Watson’s this included warm fresh cookies and great coffee in their comfortable, Wi-Fi equipped waiting room……and they even washed the truck! While waiting for the truck, I took a walk about the showroom to see what new vehicles are being offered. It was then that I came to the realization that for the cost of our new truck, I could have purchased one of these instead! 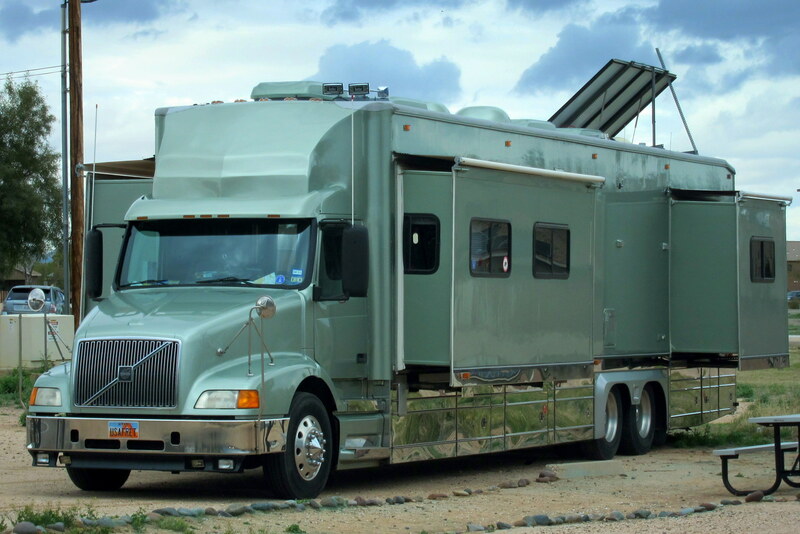 And…..factor in the cost of the new trailer, I could have purchased two! This would have come in handy because I would have surely lost one of them in the divorce settlement. 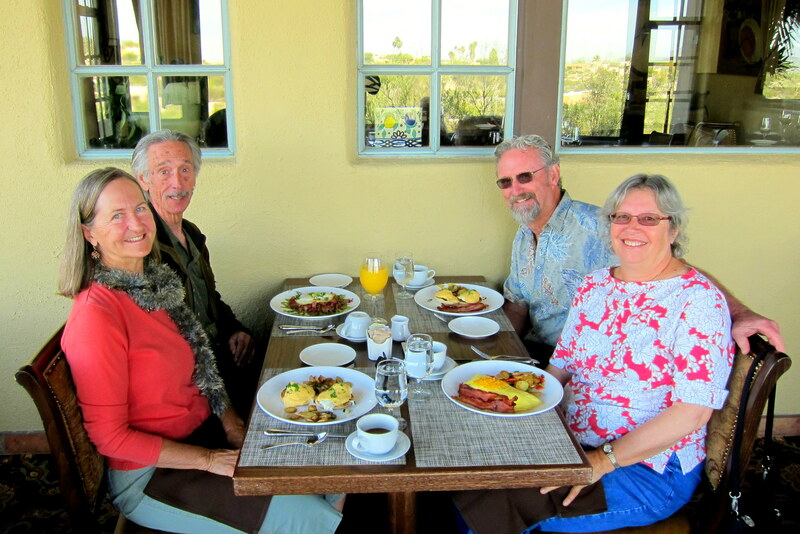 On one beautiful morning, Kit and I took Dewey and Bea out to breakfast…..but not to any ordinary place, on this morning we enjoyed the views, ambiance, and food at the Hacienda del Sol Guest Ranch. 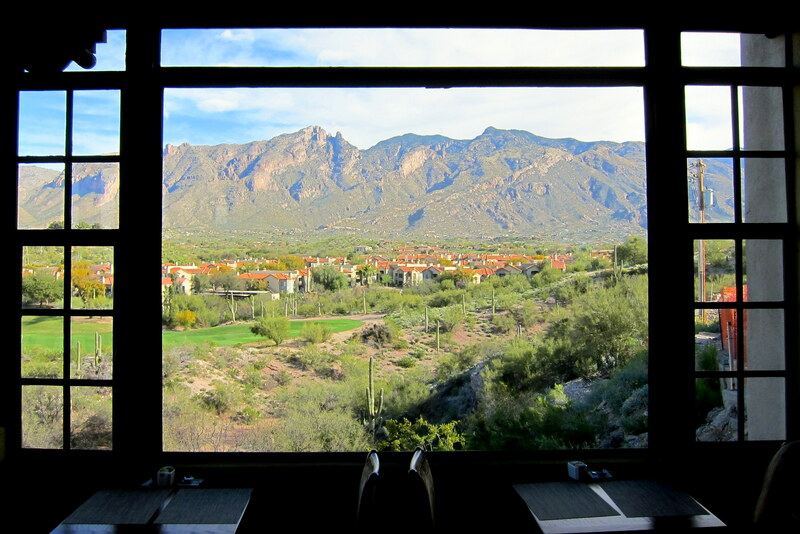 This five star establishment is nestled in the foothills of the Santa Catalina Mountains. 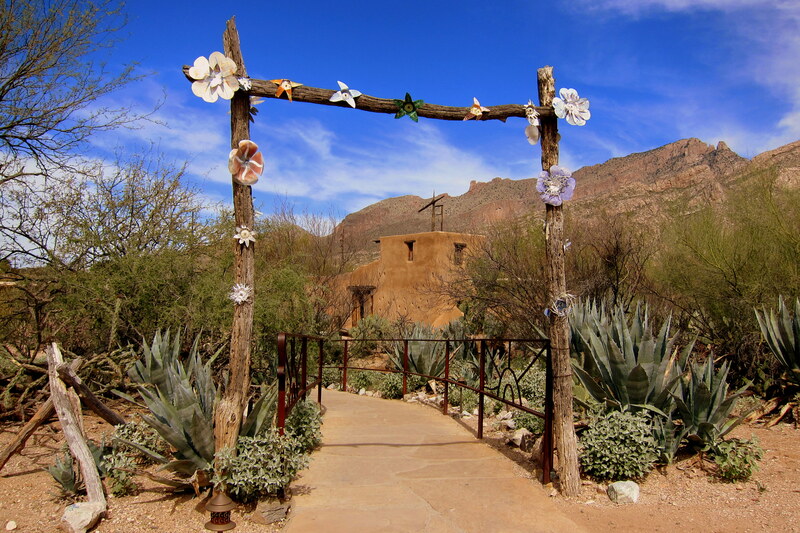 Hacienda del Sol started life as a humble dude ranch and school for girls back in 1929. It was highly favored by folks from back east such as the Vanderbilt’s, Pillsbury’s and the Westinghouse families to introduce their offspring to life outside the big cities. Below is another prominent couple from an old Culver City family out enjoying a stroll through the historic grounds. 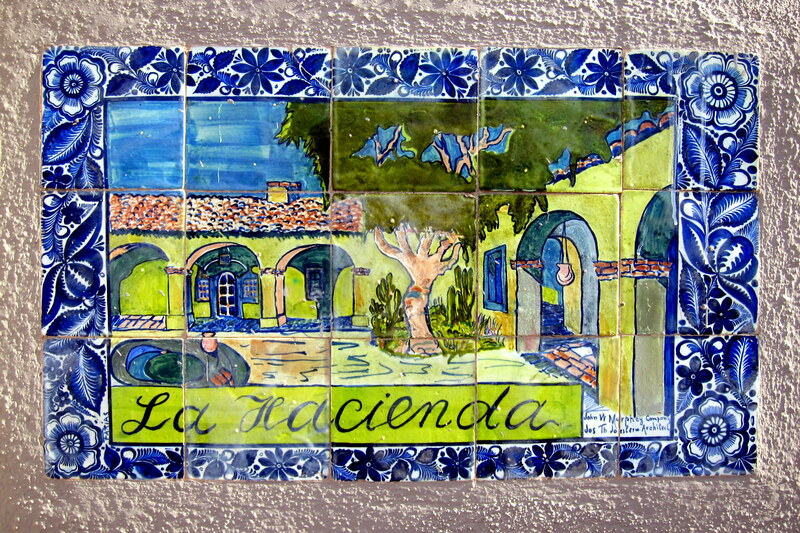 Hacienda del Sol later became a guest ranch and has been carefully preserved to retain the original Spanish Colonial ambiance. 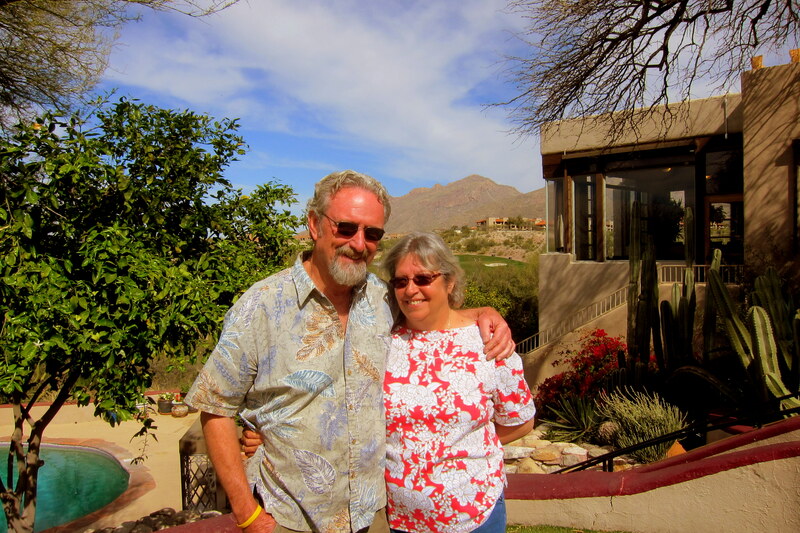 Kit and I traditionally treat folks that allow our dooryard surfing with a nice meal out…..and this year we treated our host and hostess to breakfast at Hacienda del Sol. 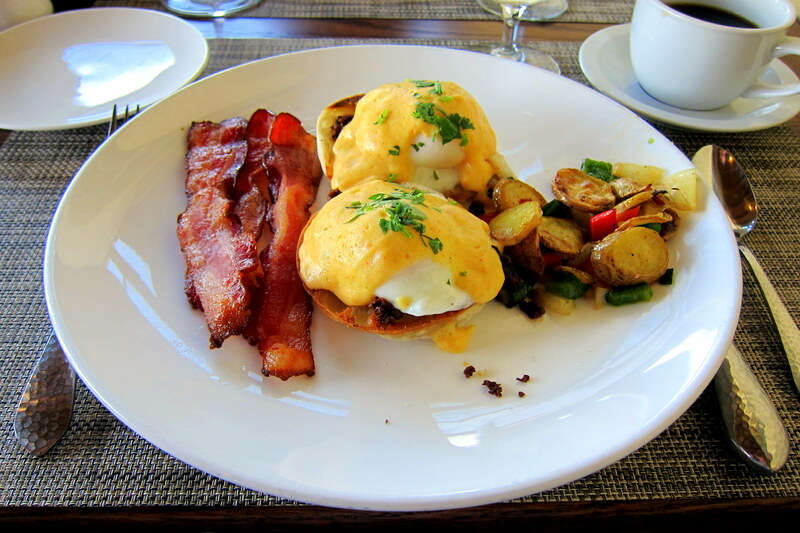 The food was magnificent……I selected the Hacienda Buffalo Benedict on Bea’s recommendation. Which substituted Buffalo Chorizo for the ham and the Hollandaise Sauce was kicked up with Jalapeno Peppers…..it was incredible…..as were the views from our table this crystal clear desert morning. Following an excellent meal with some great folks, we lulled about the property and meandered through the lushly landscaped grounds. A rather unusual combination of our favorite tastes was introduced to Kit and I during our stay. Bea has discovered this regional delicacy at her local COSTCO, which is similar to Sam’s Club back east. 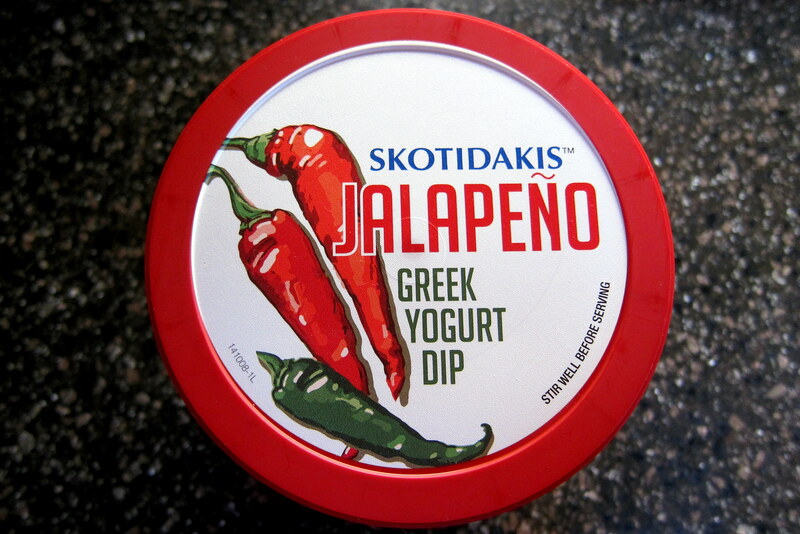 Yep…..Greek yogurt and Jalapeno! I personally devoured the better part of two tubs of this tasty treat during our week stay. Hope I can find a source for it after we return home! While in Tucson, we try and spend as much time with Brother Dan as possible. The only working stiff in our Tucson family, we like to treat him to an experience of his choosing. 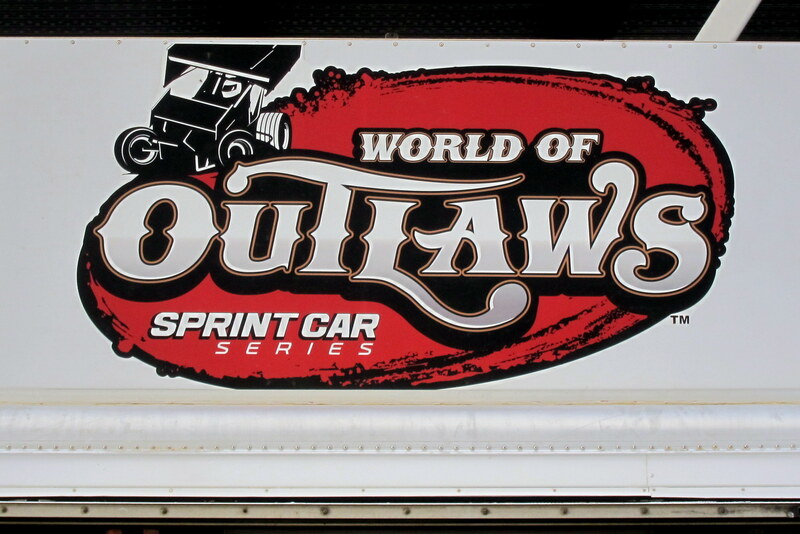 An avid auto racing fan, this year Brother Dan chose to attend the World of Outlaws Sprint Car national event conveniently taking place this week at Tucson International Raceway! 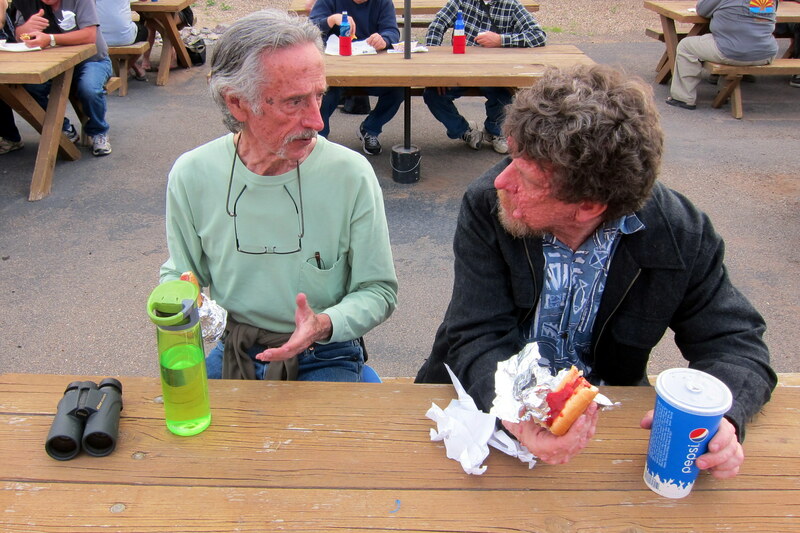 A trackside dinner was enjoyed before we headed to the grandstands. As we settled into our seats, the skies became dark and threatening…..a harbinger of the infamous desert storm. However as rain fell all around the area, we stayed dry and soon the sun peeked out to illuminate the backstretch. Sprint cars are high performance racing machines with huge wings that help hold them on the track. An unusual event that neither Dewey nor I had seen before, we were excited to share it with Dan. 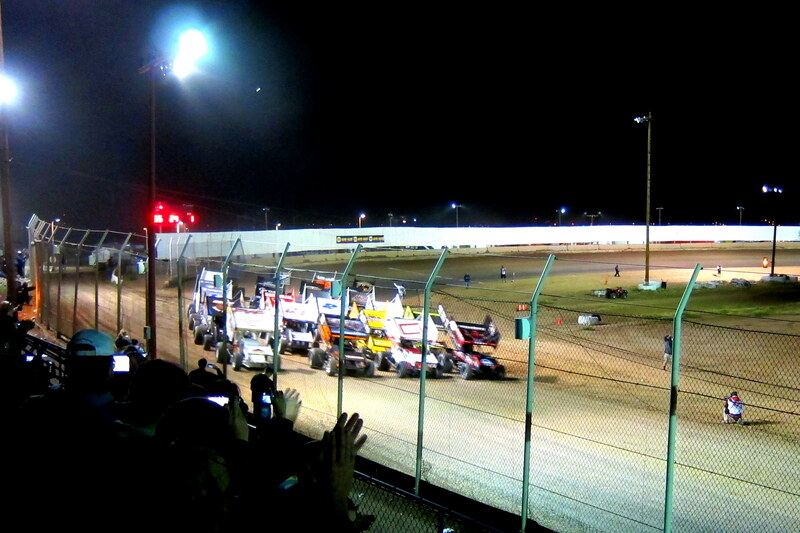 After a number of heat races, the main event was underway! 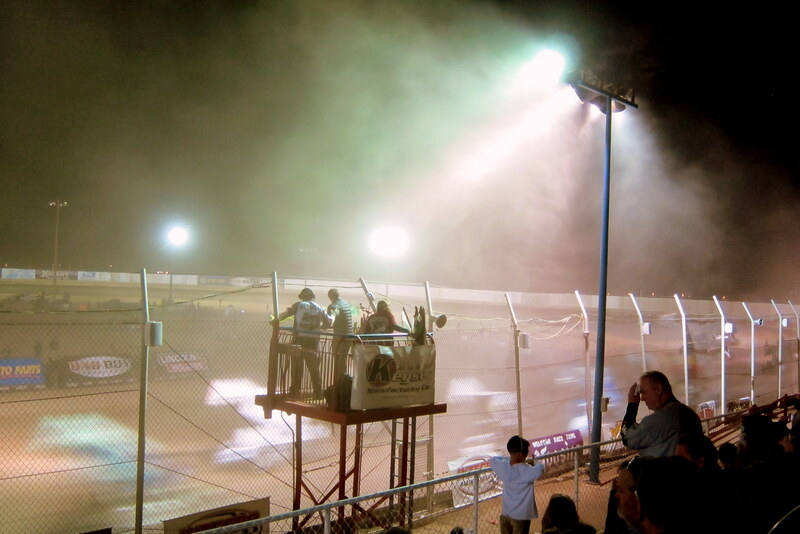 No clue as to who won, or even the color or sponsor of the victorious car…..there was way too much dust in the air!?!? 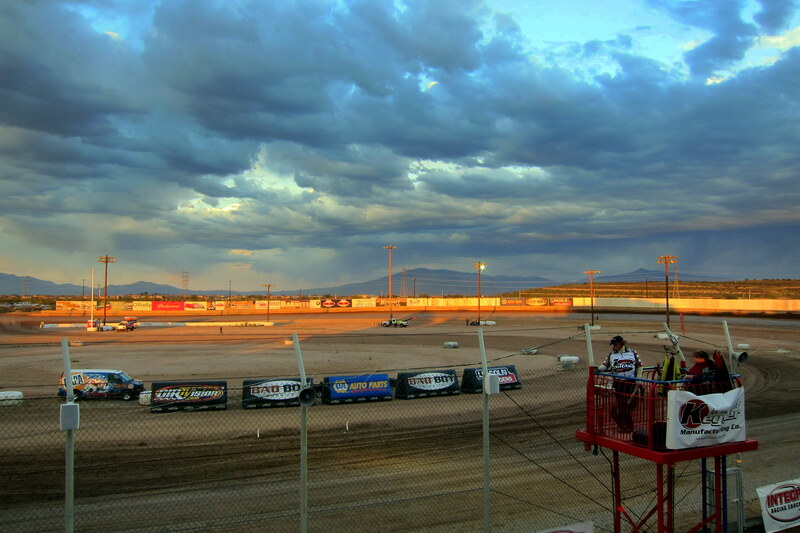 You see, this type of auto racing is run on a dirt track, in the dry desert! We all did have a great time however, even covered with a layer of Arizona desert soil. 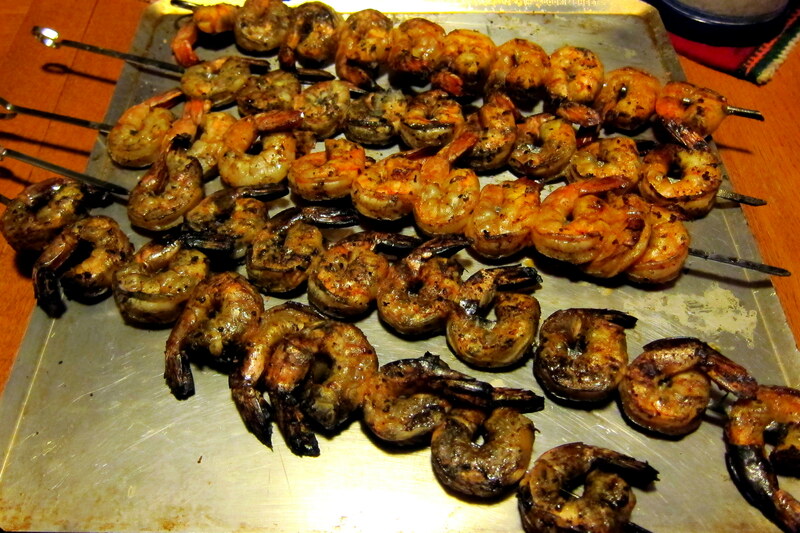 Speaking of Dan, he is an accomplished chef…..frequently he will prepare a signature dish for the family, such as his barbeque shrimp shish kabob. 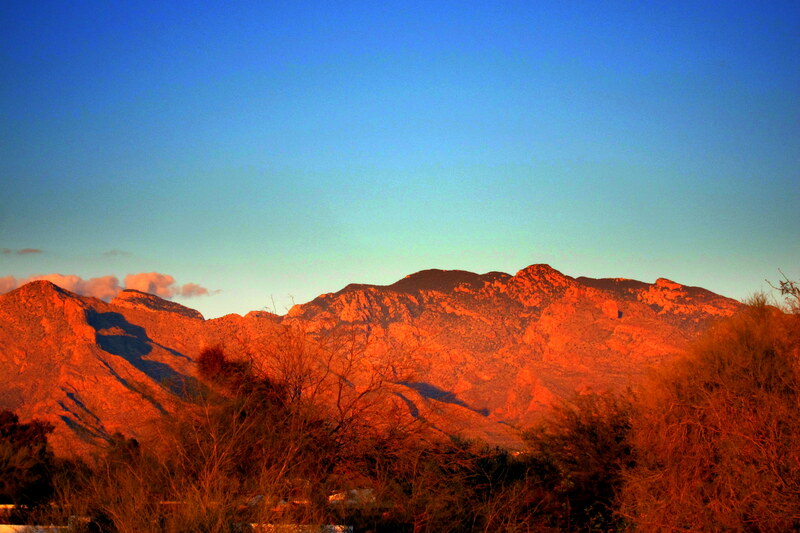 This marked the end of another delightful day in Tucson and in this case the end of our stay as well. 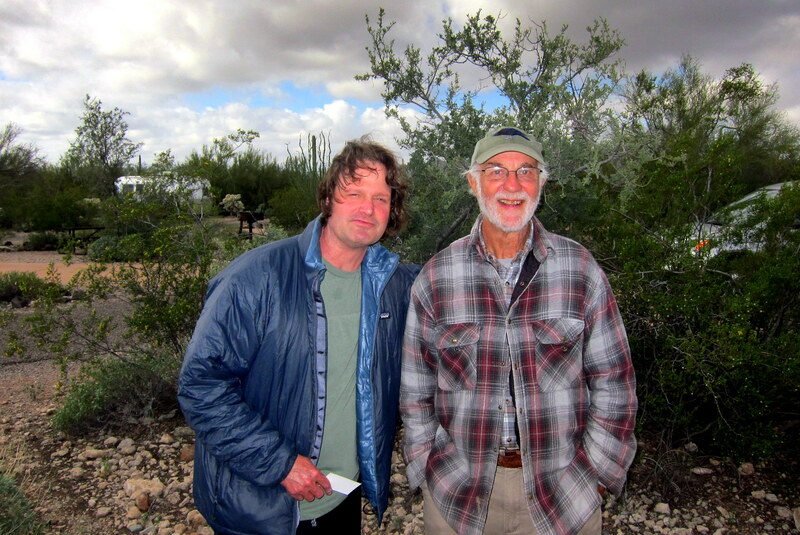 Kit’s Bit’s: We had a very nice time in Tucson. It was productive, in that we were able to go through Miriam’s home and sort out some stuff, thus helping Dan out. 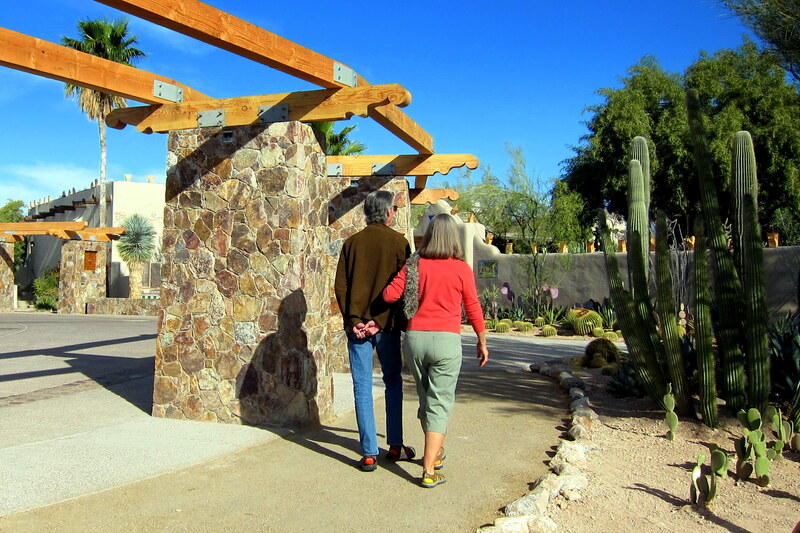 We also had a lot of family time as well as finally getting to see the DeGrazia Gallery in the Sun! I had heard of that awhile back but somehow, we never had the time to visit. A most interesting day was spent learning about his art and life. Many thanks to Dewey & Bea for their hospitality! Socks, Kimber? My guess your mom, but also to her left I’m guessing that maybe Bea has 2 different shades of pink. MM Bay still frozen in, a few open spots with a few early migrant ducks and geese. Dinner with Nan and Windy at Maxwells Friday night. Thanks for more stories of your adventures in the sun while we shiver in the never ending winter in Maine. 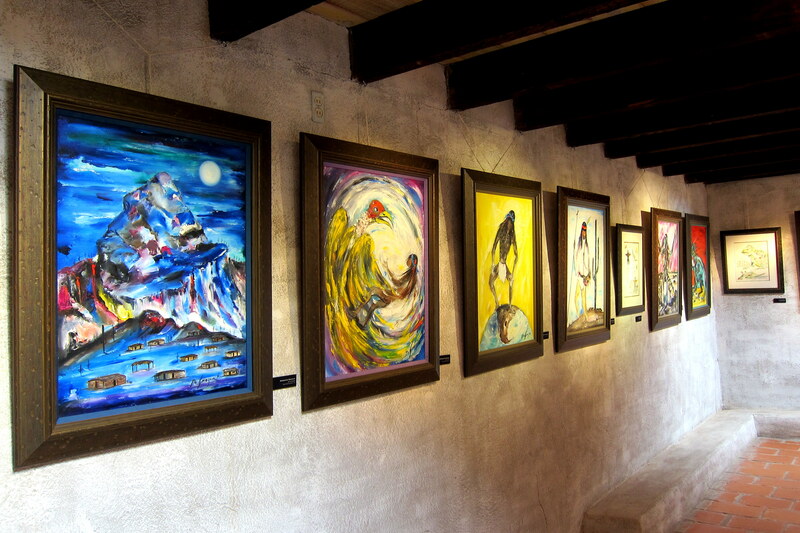 We have visited DeGrazia’s Gallery in the Sun in Tucson a couple of times, most recently last December. 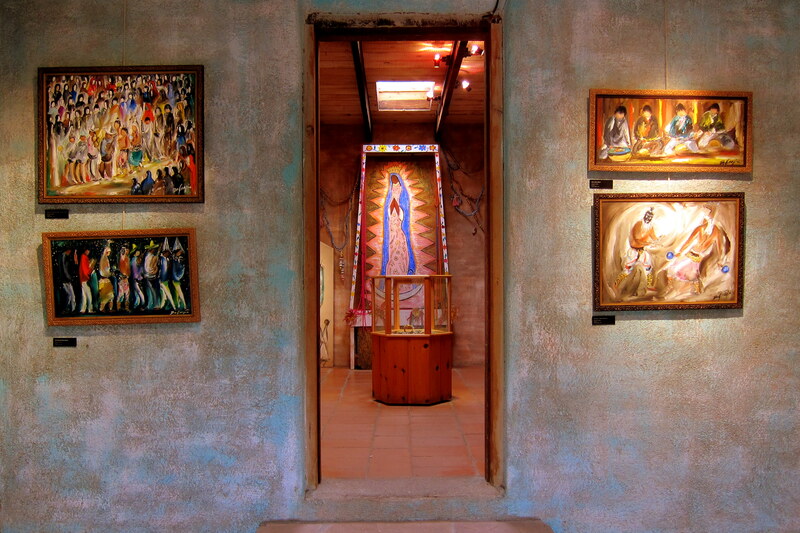 The morning we stopped by was the last day of a show in DeGrazia’s Little Gallery by a couple of contemporary artists. Jane Stern (http://www.healingangelsinc.com/default.html) makes angel sculptures and Ambika Wauter (http://lifeenergymedicine.com/art/) paints and writes books about angels. Ambika has spent time in Maine near Blue Hill. Small world.